It seems like there is parity in the men’s throwing events this year as a large number of teams have athletes scattered throughout the top of the rankings. Because of this, the athletes that perform well on the day of the championship could provide huge swings in point totals for the team title. 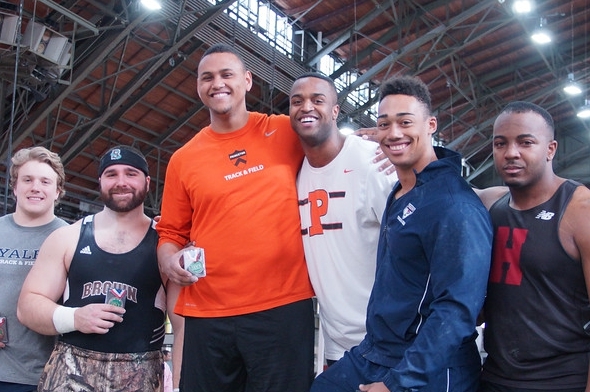 Princeton’s Chris Cook is the top performer this year (58-11 1/4), the Indoor Heps champ, and is the top returner. He is the likely favorite for the outdoor title. His teammate, Mitchel Charles, is right behind him with a throw of 57-07 1/2. Julian Nunally of Harvard is #3 in the conference and could round out the top three, along with Penn’s Sam Mattis who is right behind at 55-00. Brown’s duo of Aaron Comery and Matthew O’Hara have thrown well and should figure into the scoring, along with Princeton’s Jared Bell. Mattis is the unquestioned leader of the discus throw. The defending conference and NCAA champion, he has unleashed currently the third best throw in the world of 221-03 3/4. He is most likely to up his conference meet record which is now 202-07. In fact, he has reset the Heps meet record the last three years – will he do this again for his final Heps? Also, he is on track to make additional Heps history as being the first four-time discus champion in meet history. His teammate, Noah Kennedy-White, was fourth last year but currently has the second best throw in the conference (184-09 1/2). Familiar faces of Princeton teammates Charles and Bell, and Harvard’s Nunally should be scoring threats, along with Phuong Troung of Brown. 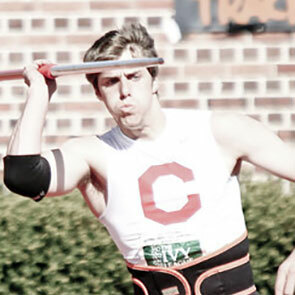 Cornell’s Rudy Winkler is the defending champion in the hammer throw and could break the conference meet record of 236-08 set by Connor McCullough of Princeton. Winkler currently has the #2 throw in the country and is #2 all-time in conference history (237-05) behind McCullough. Princeton rookie Adam Kelly has had a fantastic inaugural campaign and is the only likely competitor to Winkler. His throw of 218-05 1/4 is #18 in the country and #6 all-time in the conference. His teammate Vic Youn could figure into the scoring with a 194-03 1/4 throw. Colin Minor leads his Dartmouth teammate Tim Brennan to a possible scoring threat, as Minor was third last year and Brennan has thrown 191-07 1/2. The Brown duo of O’Hara (fourth last year) and Owen Russell also have thrown well and should be scorers. Cornell’s Rob Robbins has returned this year after two years of inactivity, and he has returned with a vengeance. His first competition this year yielded a 234-10 3/4 throw, #21 in the country. A former All-American and conference champion, Robbins looks ready to continue where he left off. The defending champ, Jacob Shippee (Dartmouth) has thrown 209-08 1/2 this year, which is #2 in the conference. He should secure this runner-up position as he is over eight feet over the other contenders. Harvard’s Brett Henderson is #3 in the conference, followed by Mark Buda (Brown), who are both the last two contenders over 200 feet this year. Ben Colello (Dartmouth) is a viable scorer, while the Penn duo of Tim Schanstra and Sam Kaplan (third last year) should round out the scoring. This entry was posted on Tuesday, May 3rd, 2016 at 3:00 pm. It is filed under Heps Champs, Men, Spotlight, Team Previews. You can follow any responses to this entry through the RSS 2.0 feed.